Defending champions the Waikato Chiefs returned to the top of the Super Rugby standings and restored their title credentials Friday with a gritty bonus-point 32-20 win over the Auckland Blues. The Chiefs scored four tries to two, including a brace for prop Ben Tameifuna, as they endured a tight first half to assert control over their New Zealand rivals in the second. The win puts the Chiefs on 35 points, level with the Sharks, who are set to play the Brumbies in a tricky away match this weekend. After a run of poor results, Chiefs captain Liam Messam said the result built on last week's win over the Lions and was a welcome confidence-booster as the team seeks a third straight Super 15 title. "It's been a pretty tough month for us when everyone doubted us, so I'm proud to see the boys bounce back," he said. "It wasn't pretty, it was ugly and tough, but sometimes you want those ones." The loss leaves the Blues stranded at the foot of the ultra-competitive New Zealand conference, making a finals berth increasingly unlikely. It was their 14th straight away loss and extends the Chiefs' winning streak over the Aucklanders to six consecutive matches, dating back to mid-2011. The Blues showed early promise when Lolangi Visinia struck a blow six minutes in, juggling the ball before touching down after Ma'a Nonu set him up with a blockbusting run down the line. Nonu, who had a role in three tries when Auckland demolished the Queensland Reds last week, then went from hero to villain when he missed a pass and gifted possession to the Chiefs, resulting in Tameifuna crashing over in the corner to level the scores. 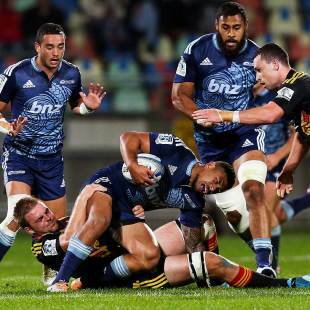 With Blues fullback Charles Piutau forced off with a tendon injury, Tim Nanai-Williams made it two tries for the Chiefs as they worked the ball across the width of the park. They exchanged two penalties apiece to make it 20-13 at half-time. The Chiefs extended their lead immediately after the re-start, pouncing on a messy Blues lineout and getting the ball to Tameifuna for his second five-pointer. They secured a bonus-point try and threatened to run away with the game when Nanai-Williams burst into open space and wrong-footed the Blues' defence, flicking a deft pass to Tom Marshall for the try. The Chiefs, who have the worst disciplinary record in the competition, let the Blues back in when Nanai-Williams was sent to the sin bin, with the Aucklanders making the most of their advantage when George Moala crossed. But the gap was too much for the Blues, and some determined Chiefs defence sealed the win.